"Knox Martin, 2012," Photograph by Ronald Lusk. _"These videos were filmed during a master lecture series given at the Art Students League of New York on Tuesday evenings for a term in 1998. The videos were made on rudimentary equipment (home video camera – no body mic). I was surprised that in spite of interruptions, noise and sometimes unclear examples (slides covering Master Artists) – they are awesome!" Special thanks to Max Horbund and David Kramer for their assistance in filming. "Knox Martin, the great American painter is also a poet. He has demonstrated this in a deceptively slender blue folio that leaps and convulses in your hand after you read it. The book is called The Mermaid Poems." 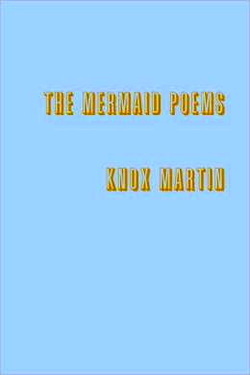 Published in 2012, this 72 page book contains poems by Knox Martin.